Industrial floor scales are designed for use in a normal warehouse where you have pallet trucks and workers weighing pallet loads for shipping. These scales (sometimes referred to as pallet scales) can be connected to a printer and typically come in either a 5000 or 10000 lb capacity. Our Rice Lake industrial floor scales carry the durable reputation and strength of the RoughDeck name. 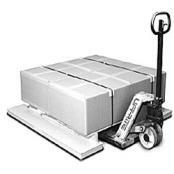 Whether its steers, steel, pallets, people, or semi trucks we have a pallet scale to fit your needs. It might seem like a good idea to build your own floor scale but in most cases it really isn't a savings when you consider all the labor involved in welding and painting, especially with standard size warehouse scales like a 4x4. Other sizes like a 6 x 6 or 4 x 8 are also available along with 4x6 or 5x5 sizes. Contact us today (919) 776-7737 for honest product reviews and product recommendations. Tell us your scenario and we will recommend the best floor scale for your needs. Avery Weigh-Tronix ProDec Floor Scale SystemAvery Weigh-Tronix Deck and Indicator System incorporates either a 48" x 48" or 60" x 60" 5,000 lb ProDec Floor Scale with Avery Weigh-Tronix ABS or Stainless Steel ZM201 Indicator or an Aluminum or Stainless Steel ZM301 or ZM303 Weight Indicator. Factory calibrated and certificate of calibration. Rice Lake Roughdeck Rough-n-Ready Floor Scale SystemThe RoughDeck® Rough-n-Ready System is a complete floor scale and indicator package. 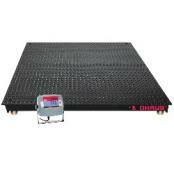 Match the durable design of our 4 x 4-foot RoughDeck floor scale with one of four quality Rice Lake indicators. Each scale and indicator arrives factory calibrated for quick setup. Cardinal Echelon EH Series Economical Floor ScalesCardinal Scale Echelon EH series floor scales provide exceptional performance in light industrial and NTEP applications for warehouses, logistics operations, processing plants, and shipping/receiving departments. 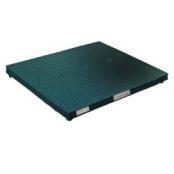 Ideally suited for pallet and package weighing, the Echelon checkered carbon steel deck tread plate with powder coat paint handles rugged industrial weighing use. 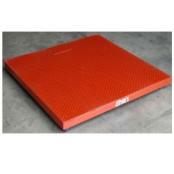 Pennsylvania M6600 Industrial Floor ScaleAll floor scales are not alike. Pennsylvania 6600 scales are designed with features that outperform the competition. Premium black powder coat finish (mild steel models up to 60 x 60" 10K capacity). Premium load cells, wide range of capacities, platform sizes from 24 x 24" to 96 x 120" and capacities to 40,000 lbs. Digi Summit 3000 Low-Profile 4x4 Floor Scale PackageDigi Summit 3000 Floor Scale and Indicator Package is an economical choice for industrial weighing tasks, with a durable low-profile deck. 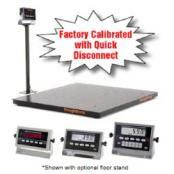 This Legal for Trade scale comes factory calibrated with easy-to-use Digital Weight Display and 20 feet of load cell cable. Brecknell DCSB Floor Scale SystemBrecknell DCSB system includes an IP65 rated mild steel general purpose weighing platform with alloy tool steel potted load cells. Factory calibrated with SBI-521 LED indicator and interface cable. Choices of sizes and capacities. NTEP legal for trade. 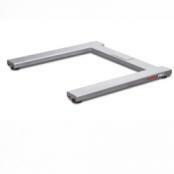 Brecknell DSB Floor Scale SystemsThe Brecknell DSB platform scale system meets the demand for a quality brand name floor scale at a market price that is competitive with all legitimate platform scale providers. Calibrated to SBI-505 readout and choice of 4x4 or 5x5 sizes. 5000 or 10,000 pound capacity. NTEP legal for trade. 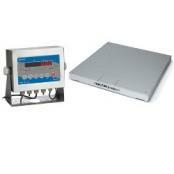 CAS HFS Industrial Floor ScaleThe HFS Series Floor Scale is available in 2 sizes and 2 capacities. Choose either the 4 x 4 or 5 x 5 at 5,000 or 10,000 lb capacities. 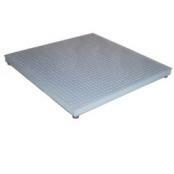 The HFS low profile design makes this floor scale ideal in any environment. Heavy duty construction and easy to use. Bundle with the popular CI-200 and CI-2001 Indicators. Cambridge 660-PW U-Shape Horseshoe ScaleCambridge 660-PW U-Shape horseshoe scale fits small and large pallets and fits all standard "pallet jack trucks" and most "power walkies". Anti-Skid diamond plate deck. 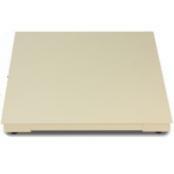 Easy access leveling feet and junction board, Low profile 3" high design. Overall size is 60" x 60" with 5000 or 10,000 lb capacity. 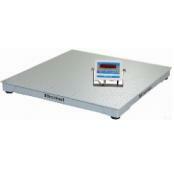 Transcell Guardian Floor ScalesThis versatile fully electronic floor scale fits the widest variety of applications. Its structural steel design withstands years of heavy industrial use. 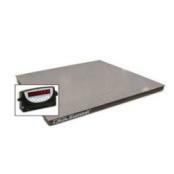 The Guardian floor scales typically come with a TI-500E (or you can select a different indicator) and factory calibration for precise weighing. Rice Lake RoughDeck PW-1 U-Shape Platform ScaleRice Lake RoughDeck PW-1 pallet scale is an economical alternative to a floor scale in manufacturing and warehouse environments. The u-shape of the pallet scale is designed to decrease cycle time when weighing pallets, skids and totes. 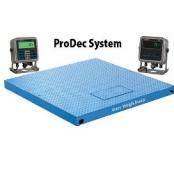 B-Tek Clydesdale Industrial Floor ScaleThe Clydesdale floor scale is designed for use in variety of applications. The scale is available (non-trade approved) with a platform size from 1.5' x 1.5' to 10' x 10' 500 to 30,000 lbs. NTEP (trade approved) platform sizes range from 2' x 2' to 8' x 10' with capacities form 2,500 to 20,000 lbs. 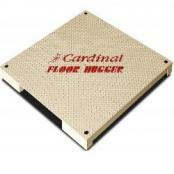 Cardinal Floor Hugger Floor ScaleCardinal Scale Floor Hugger features quality low profile, checkered or smooth steel decks, stainless steel load cells, top side access to junction box, optional ramps, platform sizes from 3 x 3-foot to 12 x 10-foot, weight capacities from 1,000 to 20,000 lb. NTEP legal-for-trade. Custom sizes available. If you need a pallet scale please give the sales team at Central Carolina Scale a call today, (919) 776-7737. 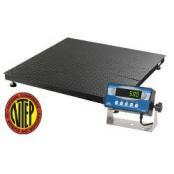 We've been providing customers just like you with a heavy duty and reliable industrial floor scale for decades. Just let us know what you're looking to do and what your budget is and we will let you know what the best pallet scale for the money is for your particular situation. 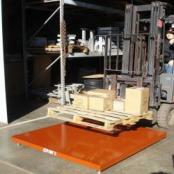 We also have accessories available like a ramp, printer, pit frame and remote display.